Paul McCartney and Stevie Wonder perform "Ebony and Ivory" at a concert at the White House in 2010. ^ Jim McCartney's father Joe played an E-flat tuba. 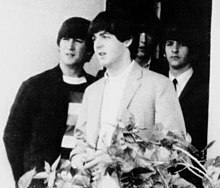 McCartney's father also pointed out the bass parts in songs on the radio, and often took his sons to local brass band concerts. ^ Pipes of Peace peaked in the UK at number 4, spending 23 weeks in the charts. The LP reached number 15 in the US and is McCartney's most recently recorded RIAA certified platinum studio album as of 2012[update]. ^ Flaming Pie reached number 2 in the UK and the US. 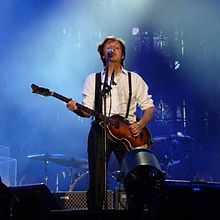 It also yielded McCartney's highest charting UK top-twenty hit song as of 2012[update], "Young Boy", which reached number 19. 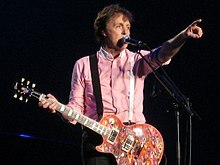 ^ Chaos and Creation in the Backyard is McCartney's most recent top-ten album as of 2012[update]. It reached number 10 in the UK, and number 6 in the US. It was supported by a UK top-twenty hit single, his most recent as of 2014[update], "Fine Line", which failed to chart in the US, and "Jenny Wren", which reached number 22 in the UK. ^ Memory Almost Full reached number 3 in the US and spending fifteen weeks in the charts. As of 2014[update], it remains McCartney's most recent top-five album. ^ As of 2012[update], Elvis Presley has achieved the most UK number-ones as a solo artist with eighteen. ^ Welch, Chris (1984). Paul McCartney: The Definitive Biography. London: Proteus Books. p. 18. ISBN 978-0-86276-125-7. ^ For 30 November 2005 Los Angeles setlist see: "Paul McCartney: The U.S. Tour". paulmcartney.com. 30 November 2005. Archived from the original on 3 June 2014. Retrieved 24 June 2012. ; For the Billboard boxscores see: Waddell, Ray (5 August 2006). "Top Tours Take Center Stage". Billboard. Archived from the original on 25 May 2013. Retrieved 13 June 2012. ^ For "among the last" of the classic rock catalogues available online see: La Monica, Paul R. (7 September 2005). "Hey iTunes, Don't Make It Bad ..." CNNMoney.com. Archived from the original on 4 July 2012. Retrieved 25 June 2012. ; For the Beatles catalogue available on iTunes see: Aswad, Jem (16 November 2010). "Beatles End Digital Boycott, Catalog Now on iTunes". Rolling Stone. New York. Archived from the original on 17 December 2010. Retrieved 17 November 2010. ^ "Paul McCartney: Ocean's Kingdom". paulmcartney.com. 2 October 2011. Archived from the original on 13 May 2014. Retrieved 26 June 2012. ^ "Paul McCartney Closes Candlestick Park 'in Style' – Rolling Stone". Rolling Stone. 15 August 2014. Archived from the original on 24 September 2015. Retrieved 27 September 2014. ^ "Destiny End Credits Easter Egg reveals Paul McCartney's Song Hope for the Future". Gamespot. 11 September 2014. Archived from the original on 13 September 2014. Retrieved 12 September 2014. ^ "Bob Dylan, Kiss and More Cover Paul McCartney for Tribute Comp – Rolling Stone". Rolling Stone. 9 September 2014. Archived from the original on 27 September 2014. Retrieved 27 September 2014. ^ "Kanye West – "All Day" (Feat. Allan Kingdom, Theophilus London, & Paul McCartney)". Stereogum. 2 March 2015. Archived from the original on 4 March 2015. ^ "67 Tracks of Pure McCartney ..." paulmccartney.com. 31 March 2016. Archived from the original on 4 April 2016. Retrieved 1 April 2016. ^ France-Presse, Agence (3 July 2017). "Beatles song rights dispute: Paul McCartney and Sony ATV work it out". The Guardian. Retrieved 4 July 2018. ^ "Paul McCartney Settles with Sony/ATV to Reclaim Beatles Copyright". fortune.com. Retrieved 4 July 2018. ^ Blistein, Jon (19 June 2018). "Paul McCartney Details New Double A-Side Single". rollingstone.com. Retrieved 4 July 2018. ^ "Paul McCartney scores first number one album in United States in 36 years". Sky News. Retrieved 17 September 2018. ^ MacDonald 2005, pp. 196–198. ^ MacDonald 2005, p. 349. ^ James E. Perone (17 October 2012). The Album: A Guide to Pop Music's Most Provocative, Influential, and Important Creations. ABC-CLIO. p. 585. ISBN 9780313379079. Archived from the original on 18 September 2017. ^ "100 Greatest Singers – Paul McCartney". The Rolling Stone. 3 December 2010. Archived from the original on 19 June 2017. ^ "The greatest singers ever – as voted by you". NME. 21 June 2011. Archived from the original on 6 March 2016. ^ "The 30 Greatest Lead Singers of All Time". The Music Radar. Archived from the original on 19 December 2014. ^ Coplan, Chris (25 May 2014). "Axl Rose is NOT the singer with the widest range". Consequence of Sound. Archived from the original on 27 May 2014. Retrieved 25 April 2014. ^ "The Vocal Ranges of the World's Greatest Singers". Concert Hotels. Archived from the original on 14 August 2015. ^ Rybaczewski, Dave. ""Kansas City/Hey-Hey-Hey-Hey!" History". The Beatles E-Books. Archived from the original on 3 March 2016. ^ "Paul McCartney – McCartney II". The Essential. Archived from the original on 6 March 2016. 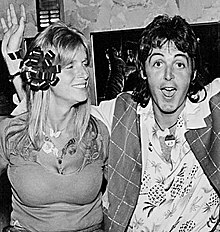 ^ "Paul McCartney/Linda McCartney – Ram". Pitchfork. Archived from the original on 16 February 2016. ^ "Soundgarden singer Chris Cornell goes quiet". stuff.co.nz. ^ "Remembering Brad Delp". stuff.co.nz. Archived from the original on 25 September 2013. ^ "'Axl Rose responds to list calling him 'world's greatest singer". The Rolling Stone. 28 May 2014. Archived from the original on 19 June 2017. ^ MacDonald 2005, pp. 178–180: "She's a Woman", MacDonald 2005, pp. 205–206: "For No One", MacDonald 2005, pp. 227–232: "A Day in the Life", MacDonald 2005, pp. 272–273: "Hello, Goodbye", MacDonald 2005, pp. 275–276: "Lady Madonna", MacDonald 2005, pp. 302–304: "Hey Jude", MacDonald 2005, p. 322: "Martha My Dear", MacDonald 2005, pp. 337–338: "Let It Be", MacDonald 2005, pp. 339–341: "The Long and Winding Road". ^ Castleman, Harry; Podrazik, Walter J. (1977). "1969 – "But If Paul's Alive, How Did He Die?". All Together Now – The First Complete Beatles Discography 1961–1975 (Second ed.). New York: Ballantine Books. p. 78. ISBN 978-0-345-25680-5. ^ Merritt, Stephanie (17 December 2005). "It took him years to write ..." The Observer. London. Archived from the original on 30 September 2013. Retrieved 3 May 2012. ^ "FoodProgramme-20130127-FoodInTheLifeOfSirPaulMccartney.mp3". bbc.co.uk. Retrieved 4 July 2018. ^ "Sir Paul McCarney Narrates 'Glass Walls'". PETA UK. 30 November 2009. Archived from the original on 12 January 2015. Retrieved 11 January 2015. 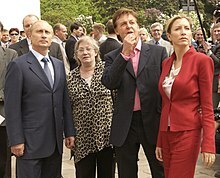 ^ "President Vladimir Putin received a legendary singer and former Beatle, Paul McCartney, and his wife, Heather Mills". en.kremlin.ru. 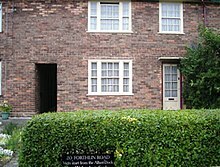 24 May 2003. Retrieved 21 September 2018. ^ "Hundreds of Protests in 36 Countries Demand Release of Arctic 30". EcoWatch. 18 October 2013. Archived from the original on 4 November 2014. Retrieved 27 September 2014. ^ Graff 2000, p. 40: "John is kinda like a constant ... always there in my being,Graff 2000, p. 96: "in my soul, so I always think of him". ^ Stewart, Barbara (2006). The Complete How to Kazoo. ISBN 9780761142218. Archived from the original on 22 January 2016. Retrieved 27 September 2014. ^ McWhirter, Norris (1980). Guinness Book of World Records. London: Sterling Publishing. pp. 235, 250, 251. ISBN 978-0-8069-0168-8. ^ "Queens Birthday Honours: McCartney a Companion of Honour". BBC News. 16 June 2017. Archived from the original on 2 July 2017. Retrieved 27 June 2017 – via www.bbc.com. ^ Andreybz (17 November 2006). "Ringo Starr - The Cooler". Retrieved 8 April 2018 – via YouTube. ^ "Tuesday (2001)". bfi.org.uk. Retrieved 8 April 2018. ^ "'Paul McCartney and Wings in The Bruce McMouse Show'". paulmccartney.com. 10 January 2019. Retrieved 18 January 2019.